The Summer Palace (Yiheyuan), located in the northwestern outskirts of Beijing, is the largest and most famous imperial garden in China. The palace features hundreds of architecturally distinct buildings, halls, pavilions, pagodas, bridges and corridors dispersed among magnificent and elegant gardens. It has an area of 290 hectares (717 acres), three quarters of which is water. 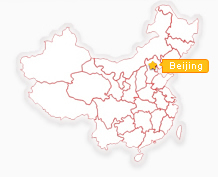 The palace has three unique areas: Court Area, Longevity Hill Area and Kunming Lake Area. The garden was originally named the Garden of Clear Ripples (Qingyi). 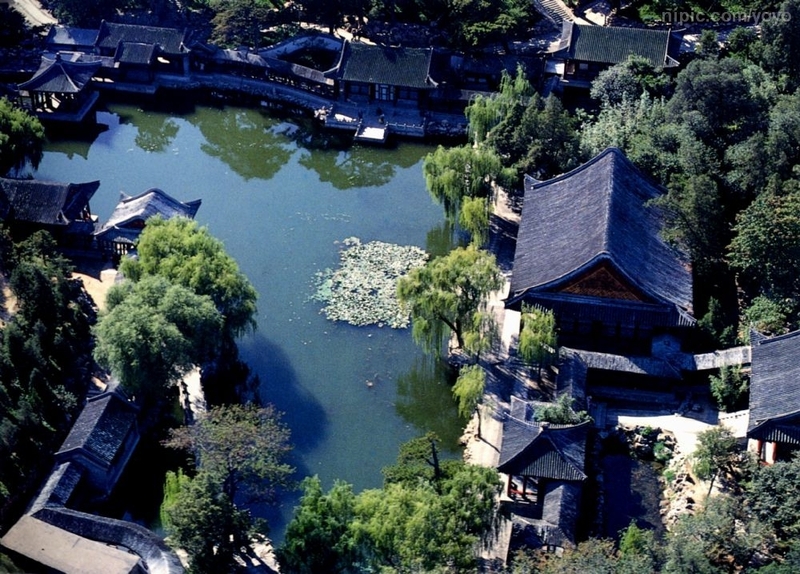 It was a summer resort for the emperors in the Qing Dynasty (1644-1911). In 1860, the garden was burnt down by the Anglo-French Allied Forces. In 1866, Empress Dowager Cixi rebuilt the garden using embezzled funds from the imperial navy and named it the Summer Palace (Yiheyuan). In 1900, during the Boxer Rebellion, the Eight-Power Allied Force ransacked the palace. After another reconstruction in 1903, the garden was restored to its original beauty and magnificence. 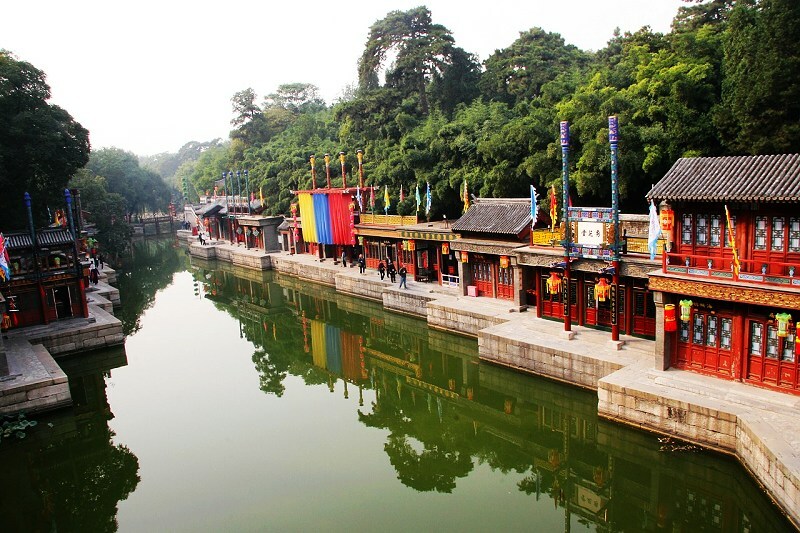 As the grandest garden in China, it was added to the World Culture Heritage list in 1998. The East Palace Gate (Donggongmen) opens into the Court Area. Inside is a group of typical courtyard houses connected by porches. The center building is the Hall of Benevolence and Longevity (Renshoudian) where Emperor Guangxu, the last emperor of the Qing Dynasty, held court and conducted official business during his stay at the garden. Now, an exquisitely carved screen, a bronze dragon and bronze phoenix are on display. 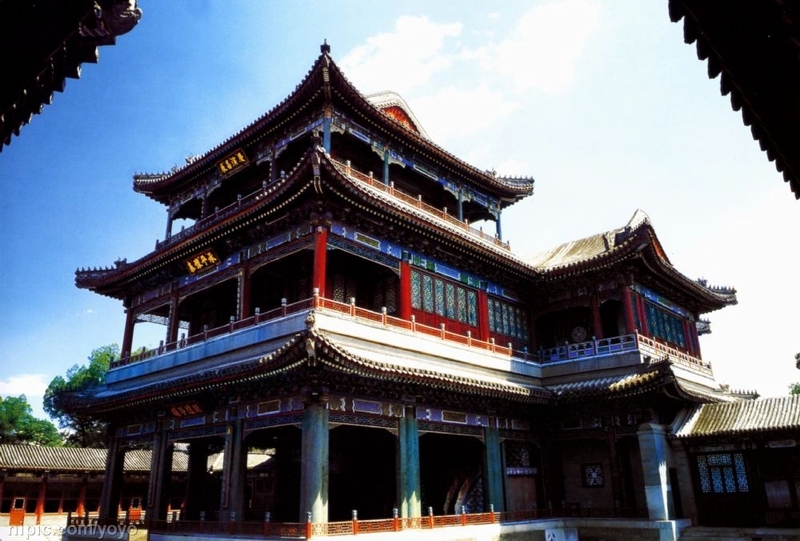 To the northwest are three halls: the Hall of Jade Ripples (Yulantang) where Guangxu lived; the Hall of Virtue and Harmony (Deheyuan), the biggest theater in the Qing Dynasty; and the Hall of Joyful Longevity (Leshoutang), a splendid residence of Empress Dowager Cixi. To the northeast is the Garden of Harmony and Enchantment. This was where the emperors spent their leisure time fishing. The East Palace Gate (Donggongmen) is the main entrance to the Summer Palace. It has three doors, the one in the center being exclusively for the emperor and the empress, and the two side doors for nobles and ministers. The three characters, Yi He Yuan (Summer Palace), on the plaque of the gate, were written by Emperor Guangxu, the last but one emperor of the Qing Dynasty (1644-1911). This emperor is said to have worked at calligraphy specially so as to give a good account of himself in handwriting. The stone carving leading to the middle door has a design of two dragons, symbol of imperial dignity, playing with a ball. The Hall of Benevolence and Longevity (Renshoudian) was a place where the emperor temporarily conducted his business. It was originally built in 1750, and named Qinzhengdian (Hall of Industrious Government), which reminded the emperor to be diligent in transacting state affairs while relaxing in the garden. Destroyed by fire in 1860, the hall was rebuilt and given its present name, Renshoudian. The words, which translate as Benevolence and Longevity, were taken from the Analects of Confucius, to imply that the emperor who applied a policy of benevolence would live a long life. In the hall, a throne, a wall screen, decorative fans made of peacock feather, incense burners, crane-shaped lights remain laid out as they originally were. The wall screen is quite exceptional, for it has nine dragons and 226 examples of the Chinese character forLongevity, in different styles. In front of the hall, there are bronze phoenixes and dragons, with hollow abdomens. When incense was burnt inside, they would smoke, adding aroma to the atmosphere during the ongoing court in the hall. In the courtyard, four unusual stones, dark in color and with holes, represent the four seasons of the year. To the north of the hall, visitors may observe a well, Yannianjing (Well of Prolonging Life). Empress Dowager Cixi is said to have recovered from sunstroke after drinking the water from the well and bestowed on it the name. 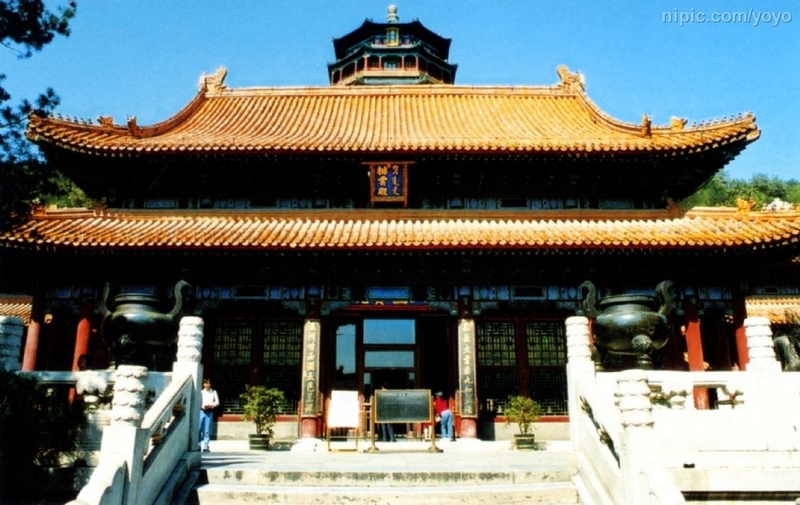 The Hall of Jade Ripple (Yulantang) is a courtyard consisting of a main hall and two subsidiary halls. It was Emperor Guangxus dwelling on his visits to the garden. The original halls had back doors which communicated with other halls or the lakeside. Emperor Guangxu, a nephew of notorious Empress Dowager Cixi, ascended the throne at the age of four as a figure-head - It was Cixi who actually exercised the imperial power. In 1898, Guangxu started a political reform to overturn the outdated laws. This resulted in a fierce conflict with Cixi, the head of conservatives. The ill-fated reform lasted only 103 days and was aborted due to Cixis suppression. After the failure of the 1898 Reform Movement, the hall was the place where Emperor Guangxu was imprisoned for ten years. Every year, the Emperor was brought here and confined to this small courtyard until his death while Cixi enjoyed her retreat in the garden. During that time, additional walls were built in the halls to prevent Guangxu from escaping and contacting other people. Even today, walls, the witness of the court coup, can still be seen in some rooms. 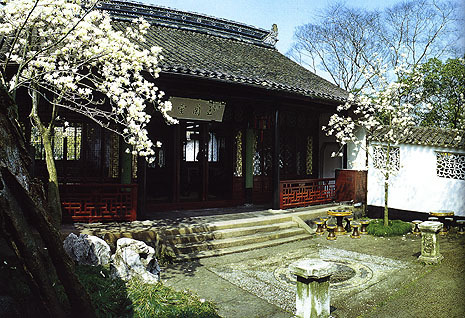 Construction of the Garden of Virtue and Harmony (Deheyuan) commenced in 1891 and was completed in 1895. It was designed as a theatre for the Empress Dowager Cixi, and consists of a theater building, and two halls, Yiledian (Hall of Nurtured Joy) and Qingshantang (Hall of Celebrating Benevolence). It is the largest of the three famous theaters built in the Qing Dynasty (1644-1911), the other two being the Changyin Pavilion of the Forbidden City and the Qingyin Pavilion of the Mountain Resort in Chengde, Hebei Province. The theatre building, 21 meters (69 feet) high and 17 meters (56 feet) wide, consists of three storeys with colorful multiple eaves and elegantly raised corners. With raise catwalks in the ceilings and a winch on the top floor of the building, performers could seem to come down from the heaven or emerge out of the earth. Beneath the ground floor, there is a well and ponds which could spout suddenly to create a water scene. 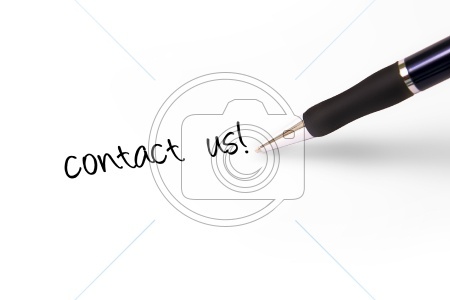 The lighting and sound systems heighten the whole effect. In the past, when there was thunderous clamor on the stage, Empress Dowager Cixi would enjoy the play cozily in the Hall of Cultivated Joy and afterwards rested at the Hall of Celebrating Benevolence. Now, the garden has been converted into exhibition halls to display the daily utensils used by the imperial family, including bronze wares, porcelains, jade articles and other precious objects. The Hall of Joyful Longevity (Leshoutang) was the occasional residence of Empress Dowager Cixi in the late Qing Dynasty (1644-1911). This large complex enjoys a prime position, facing the Kunming Lake, and backing onto the Longevity Hill. 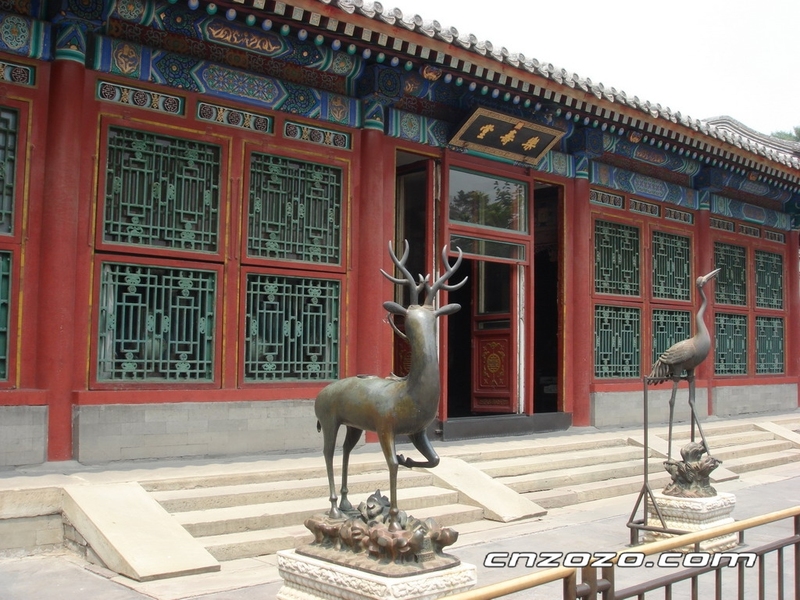 In front of the hall, bronze deer, cranes, and vases are displayed, signifying peace with their combination of Chinese elements. Planted inside the yard are magnolias, haitang (Chinese flowering apples tree) and peonies, symbolizing riches and honor. The exquisite rockery in the courtyard has existed since the reign of Emperor Qianlong, the fourth emperor of the Qing Dynasty. The main hall is divided into a living room in the center, bedroom in the west and dressing room in the east. All the rooms are decorated in an imperial style, luxurious and delicate. Positioned in the living room are a throne, a desk, glass screen and fans. Beside the throne are four bronze incense burners and two large blue and white porcelain bowls. The latter performed a double function: to hold fruit and to give off perfume. It is said that the hall was also the first place to be installed with electric lights in China and Cixi the first person to use electricity. Only then was its use spread gradually throughout China. The Longevity Hill Area faces the Kunming Lake in the south and is backed by the Rear Lake (Houhu) in the north. In the front hill, grand halls are built along a north-south axis. The halls are the Hall of Dispelling Clouds (Paiyundian), Tower of Buddhist Incense (Foxiangge) and the Hall of the Sea of Wisdom (Zhihuihai). 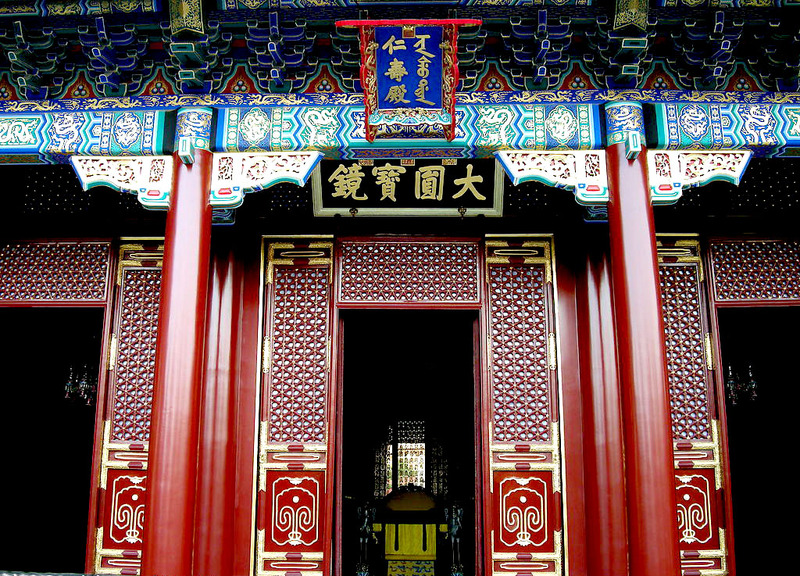 The Hall of Dispelling Clouds, with red pillars and yellow tiles, is the most splendid building of the whole palace. 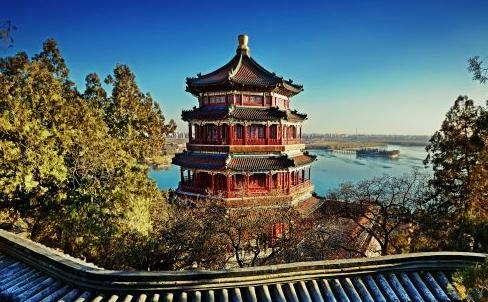 The grand Tower of Buddhist Incense, towering 41 meters (134.5 feet), is the symbol of the Summer Palace. The Hall of the Sea of Wisdom on the top of the Longevity Hill is a Buddhist hall. The outside of the hall is decorated with glazed tiles. There is a Suzhou Market Street (Suzhoujie) at the Rear Lake. With waterway passing through and shops perching on banks, the street looks like the very scene of Water Country in the south region of the Yangtze River. The Long Corridor (Changlang), 728 meters (796 yards) in length, is the longest of its kind not only in China but also in the world. In 1992, it was put into the Guinness World Record as the longest corridor of the world. Running from the Yaoyuemen (Gate of Inviting the Moon) in the east to the Shizhang Pavilion in the west, the corridor includes 273 sections, all decorated with paintings. Along the corridor, four elegant octagonal pavilions are interspersed in order, each of which symbolizes one season of a year. The corridor is also an exceptional art gallery, featuring more than 14,000 pictures of landscapes, flowers, birds, human figures and stories on its beams and ceilings. It is an excellent carrier of the Chinese culture, including traditional art, history and literature. Of special note are the pictures of human figures depicting stories that give a lively account of long history of China. As there isnt additional explanation in the pictures, visitors have to imagine what the picture is about from peoples expression, costumes, acts and the narrative scenes. The corridor wanders westward from the Court Area, along the north bank of the Kunming Lake, at the foot of the Longevity Hill. 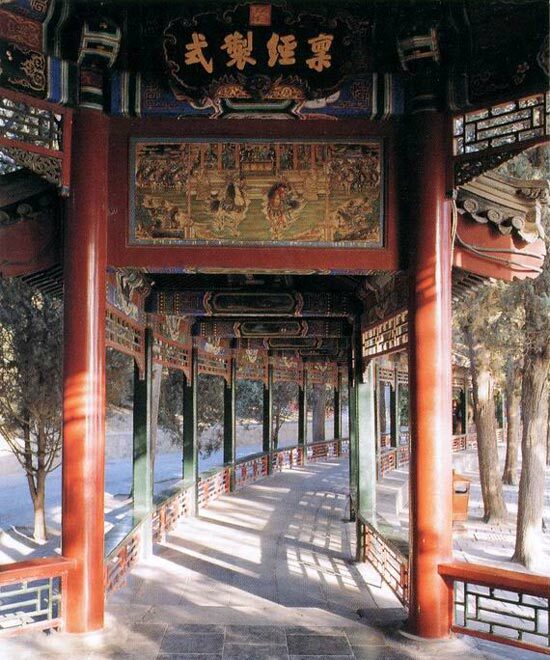 It is virtually a smart connecter of the three scenic areas in the Summer Palace, which make it a primary route for visiting the whole garden, rain or shine. Such a hall of great luxury was used only once a year for a ceremony to celebrate Cixis birthday. During the ceremony, Cixi sat on the throne inside the hall while Emperor Guangxu and the other ministers came to show their respect and honor to her. The hall is located in the middle of the front hill and the Tower of Buddhist Incense, a symbol of theocracy, lies at its back. The tower embodies the divine right of the king. The Tower of Buddhist Incense (Foxiangge) is the symbol of the Summer Palace and an elaborate work of classical architecture. The three-storied tower, situated on a hill, is about 40 meters (131 feet) high and has a complicated structure. It has eight facades and quadruple-layered eaves, and the whole is supported by eight pillars of lignum vitae wood. It is the center of Summer Palace, with buildings distributed symmetrically around its base. The Precious Cloud Pavilion (Baoyunge) to the west of the tower, made out of 207 tons (456,357 pounds) of bronze, is exquisite and noteworthy. Visitors can climb the tower for a panoramic view of the area. As an imperial worshipping tower, it enshrines a Buddha made in the Ming Dynasty (1368-1644). The elegant and dignified statue, also called Buddha with One Thousand Hands and Eyes, is five meters (16 feet) tall and has twelve heads and twenty-four arms. Empress Dowager Cixi burned incense and prayed in the tower on the first and fifteenth days of every lunar month. At the top of the Longevity Hill is the Hall of the Sea of Wisdom (Zhihuihai), whose name recalls the infinite wisdom of the Buddha. No wooden pillars or girders have been used in the construction of this two-storied hall; instead, masonry arches provide structural support. 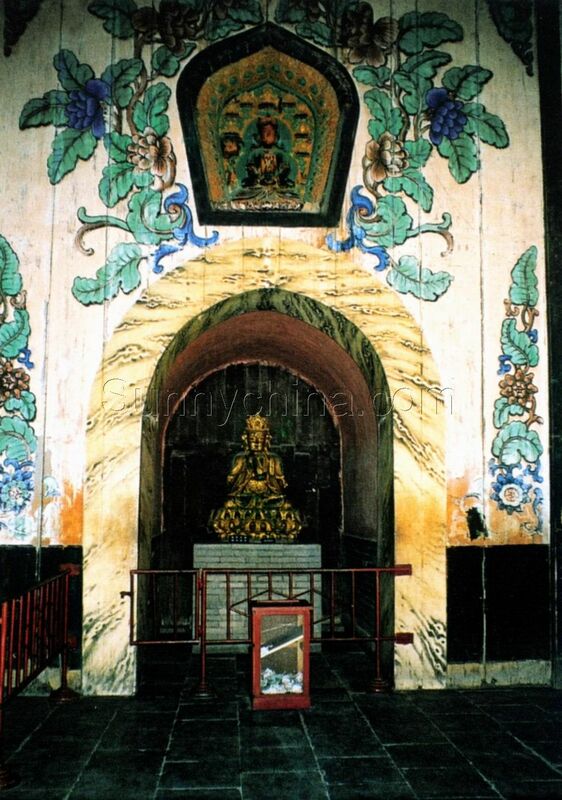 Inside the hall is worshiped Kwan-yin and its outer wall takes on an uncommon scene. The whole wall was beautifully decorated with colored glazed flakes and there are over one thousand small Buddha statues in the wall. 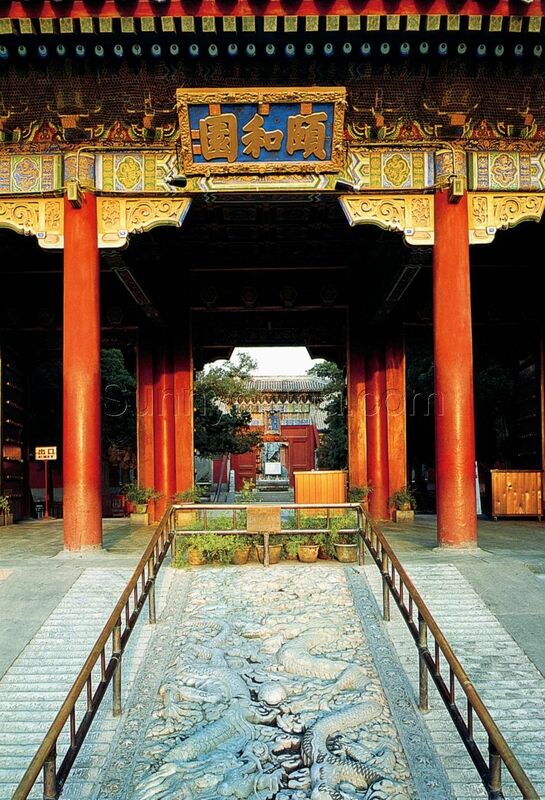 In front of the hall there is a Paifang, an ancient Chinese gateway, named Zhongxiangjie. The Hall of the Sea of Buddhist Incense symbolizes the Buddhist land while the gateway serves as the door leading to pure land. To get here, one must plod by steps which were built on purpose to test the pilgrims religiosity. It is also made up of bricks and stones and is inlayed with color glaze on its exterior. Due to its structure, the gateway, together with the Hall of the Sea of Wisdom, is the scarce survivor that escaped from the fire set by the Anglo-French Allied Forces. Behind the Longevity Hill, the Kunming Lake narrows significantly, forming the Back Lake (Houhu). 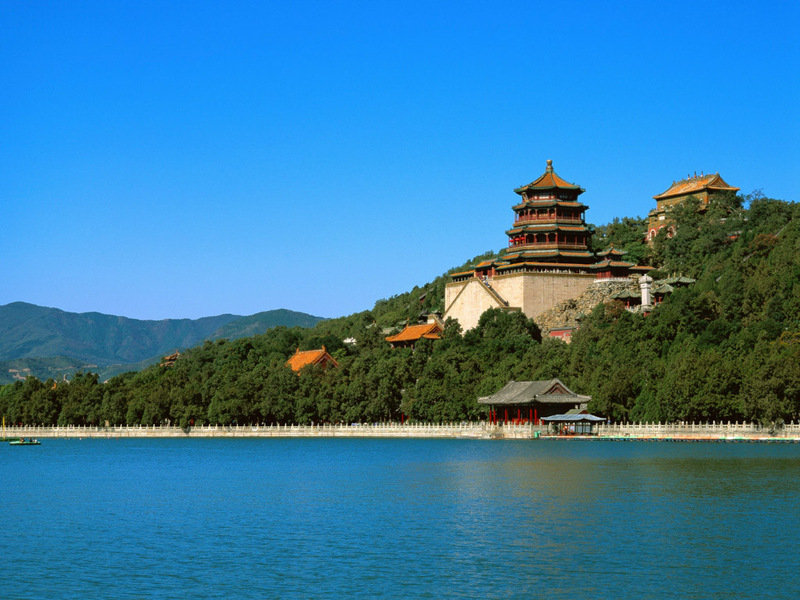 Longevity Hill is covered with many structures and since it is surrounded by water on three sides, the lake is convenient for fire-fighting when need arises. On the opposite side of the lake, there is a stretch of rockeries. The Suzhou Market Street (Suzhoujie), located behind Longevity Hill, is the middle section of the Back Lake. The Market is great fun, because the lake serves as the street with the stalls and shops on its banks. It has all the features of other market streets in Suzhou, a famous Water Town in China. The ancient-style street, about 300 meters (328 yards) long, transports the tourist back to the mid-18th century of China. It was built originally during the reign of Emperor Qianglong to give the emperor and his empress and concubines the experience of shopping in the Water Town. At that time, the eunuchs would act as clerks and shopkeepers, lending an air of realism to the experience. Over sixty old-styled stores, including restaurants, teahouses, pawn shops, banks, drugstores, clothing shops, dyers and publishing houses line the banks. The storekeepers, shop assistants, boaters and policemen on patrol are all dressed in costumes of the Qing Dynasty (1644-1911). The Garden of Harmonious Interests (Xiequyuan) was the place where emperors and empresses went fishing and took in the scenery. The garden was modeled after a garden in Southeast China, which indicates that the Summer Palace is a museum of Chinese gardens. At the center of the garden is a pool with lotus flowers which are in full bloom during the summer. The pool is accentuated by nearby pavilions, towers and cloisters. The water warbles over its rocky bed, playing a harmonious musical chord. The tower appears to be only one storey but actually has multiple floors. What a wonderful tower!Bridges perch over the pond, and are a perfect addition to the landscape and blend in with the elegant character of the site. During the Qing Dynasty (1644-1911), Emperor Qianlong, the fourth successor, conducted his inspection tours to the areas south of the Yangtze River. On his visits, he was so deeply impressed by a garden at the foot of Mt. Hui in Jiangsu Province, that he had a garden with the name of Mt. Hui Garden built in 1751 in the image of the garden at Mt. Hui. In 1881, the garden was restored and given the name Garden of Harmonious Interests. Burnt down by the Anglo-French Allied Forces, the garden was reconstructed during the reign of Emperor Guangxu. Along the south bank of the attractive lake, a 728-meter-long corridor (Changlang) is the longest and most famous corridor in China. It serves as a link between the Longevity Hill and the Kunming Lake. Around 14,000 impressive paintings of historical figures, landscapes, birds and flowers adorn this corridor, making it into a fantastic gallery. There is a Marble Boat at the west bank. This boat was built in 1755, in the hope that the governance of the Qing Dynasty would be impregnable under any circumstance. The south part of this natural lake is modeled after the West Lake in Hangzhou. A western bank divides the lake into two parts. Six graceful bridges act as connecters of the entire western bank, among which the Jade Belt Bridge is a favorite of the Emperor Qianlong and Empress Dowager Cixi. The spectacular Seventeen-Arch Bridge (Shiqikong Qiao) connects the eastern bank and Nanhu Island. The bridge is 150 meters (492 feet) long and eight meters (twenty-six feet) wide. 564 stone lions with different expressions and gestures on the balusters are strikingly life-like. 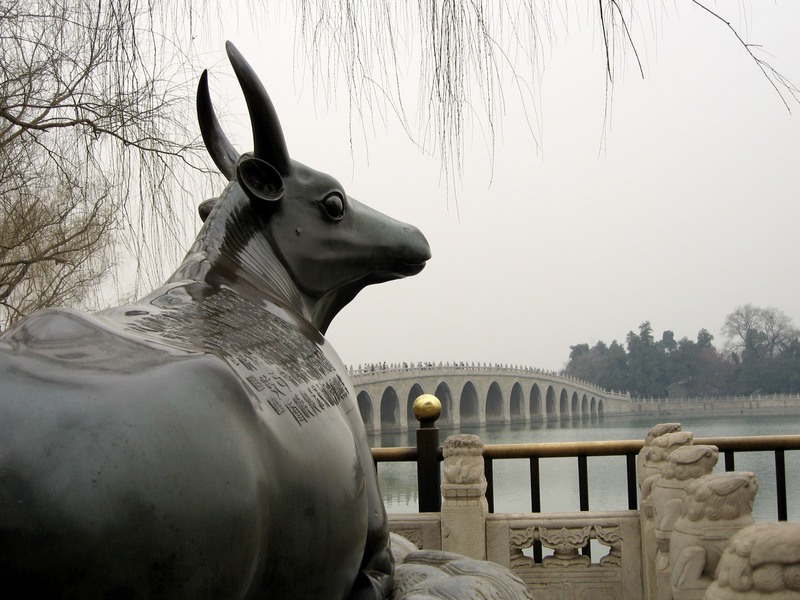 On the east bank of Kunming Lake, east of Seventeen-Arch Bridge, visitors may see a bronze ox. This bronze ox was made in 1755 during the reign of Emperor Qianlong, the fourth emperor of the Qing Dynasty (1368-1644). It is of the same size and vividness as a real one, which reflects the extraordinary craftsmanship of the foundry. The ox is nestled on a bluestone base carved with waves, and looks into the landscape with his head raised and his eyes shining. The inscription engraved in his back was written by Emperor Qianlong and has not deteriorated at all despite its age. The inscription is comprised of eighty characters, explaining the story of this bronze ox. Emperor Qianlong placed it at the bank of the lake in hope that it can restrain a potential flood brought by the Kunming Lake and bring infinite blessing to both the garden and the nearby dwellers. The Seventeen-Arch Bridge is the only connection to the Nanhu Island. It was built during the reign of Emperor Qianlong in the Qing Dynasty (1644-1911). No matter how you look at the great bridge, it is beautiful, like a rainbow or an ornamental ribbon. The Summer Palace does, indeed, offer many scenic spots. 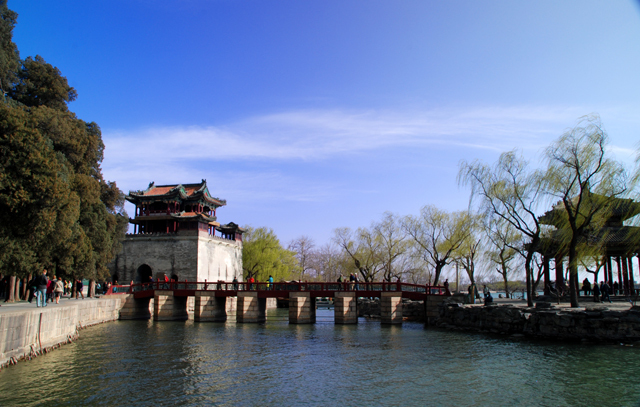 The Seventeen-Arch Bridge is an imitation of the celebrated Marco Polo Bridge (Lugou Bridge) in Fengtai District, Beijing. As the name suggests, it has seventeen symmetrical arches, with the largest one in the center and the others diminishing in size on either side. The arch and its reflection in water are an awesome sight. The bridge is 150 meters (164 yards) long and 7 meters (23 feet) high, which gets corresponds with the grandeur of the imperial garden. The bridge is decorated with 544 delicately carved lions. This vivid lions, sitting on the white marble balusters, have different expressions and postures. 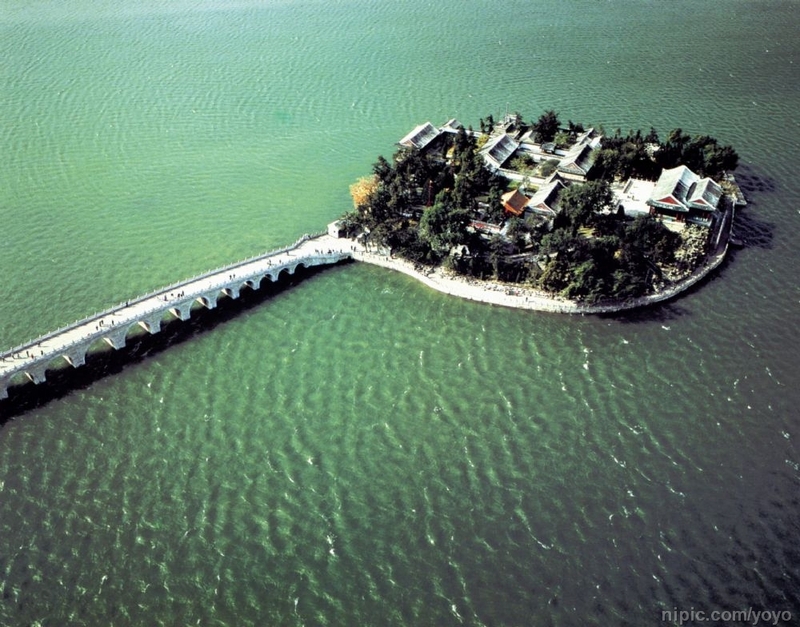 The Nanhu Island with an area of over one hectare (2.5 acres) is the largest one among the three islands in the Kunming Lake. The island situated in the southeast of the lake, is connected with the east bank by the Seventeen-Arch Bridge. The whole island is edged by laid huge stones and enclosed with carved stone fence. Seen from the distance, the island together with the Seventeen-Arch Bridge looks like a tortoise stretching his neck. As tortoise is a symbol of longevity in Chinese culture, the similarity in shape justly satisfied Emperor Qianlong, who built this garden in the name of celebrating his mothers sixtieth birthday. At the west end of the Long Corridor, visitors may easily find a boat, named Marble Boat (Shifang). This two-storied boat was originally built in 1755 in Chinese style during the reign of Emperor Qianlong, but its superstructure was burnt out by the Anglo-French Allied Forces. In 1893, Empress Dowager Cixi had it rebuilt in an imitation of western-style yachts. The boat is not entirely made of marble, but has some wood subassemblies. The wood, however, gussies up marble texture perfectly, which makes it harmonious with the main marble body. This luxurious boat has its historical origin with Wei Zheng, a famous faithful minister of the Tang Dynasty (618-907), who told the emperor, The waters that bear the boat is the same that swallow it up. In the words, he compared the relationship between the emperor and his people as that between a boat and waters. In this way, he suggested that the emperor love his people, otherwise, the exasperated people would overthrow the emperors reign. Emperor Qianlong had the firm boat made of stone, hoping that the reign of the Qing Dynasty would never be toppled.